Apple’s Worldwide Developers Conference - WWDC 2015 would be starting on June 8 and the company would be showing some new exciting products at that time. Some of the highlights expected from rumours circulating are from Mac, iPad and iPhone hardware to new updated versions of iOS and Mac OS X. WWDC is one of the highlights of Apple’s annual calendar and is a huge annual get-together for the company’s software partners. It is one of those occasions where Apple unveils a range of updated products, usually new versions of iOS and OS X, besides new hardware which includes new Macs and probably new iPads. 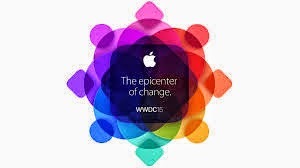 Apple had issued an invitation on April 14 with the announcement of hosting WWDC 2015 representing the 26th year of the annual conference from 8 to 12 June at San Francisco’s Moscone West.The location is not a surprise since Apple has been always been conducting WWDCs there for a long time. Rumours with regards to this event had been circulating after WWDC 2014 closed its door with a suggestion that WWDC 2015 would be held on those dates. Apple had sent out invitation to WWDC which had a shape in the middle that was identical to an Apple TV. Inside the shape was inscribed `the epicentre of change’. This fits well with the rumours about the Apple TV which indicate that the Apple TV would be a central hub of everything connected to HomeKit, an Apple’s API which would be controlling the entire gadget all in the house. It is to be seen why Apple would need the Apple TV in controlling the devices in the home. But this equation has been missed out last June since Apple’s introduction of its HomeKit solution at the WWDC 2014 and the same has not really been launched to the public. There are more interesting things coming up with regards to the Apple TV if one cares about the rumours circulating. It is said that Apple TV App Store would not only open up the Apple TV to iOS apps but also games and it is to be seen how games developers could translate their iOS games for TV screen where the control mechanism is the biggest issue. However, this will be a popular addition to Apple’s box without any doubt. Apple it is said would be planning a subscription service, offering streaming TV shows from various sources. One of the issue of the Apple TV presently is that if one wants to watch a specific show, they would have to locate which of the Apple TV channel would be showing it. Apple would be resolving this, providing one place to search for the content and one place to stream it from. Featuring 100 + Technical Session/1,000 Apple Engineers…. An announcement in Apple’s email informed that `at WWDC, Apple’s renowned developer community would be coming together to learn about the future of iOS and OS X, helping them continue to create the most innovative apps in the world. WWDC would be featuring more than 100 technical sessions over 1,000 Apple engineers, hand-on labs to help developers integrate new technologies and fine-tune their apps and the Apple Design Awards which showcase the best new apps in the last year’. Philip Schiller, Apple SVP of Worldwide Marketing has commented saying `we’ve got incredible new technology for iOS and OS X to share with developers at WWDC and around the world. We can’t wait to see the next generation of apps they create’.Individuals could check out ways to get hold of the tickets for the forthcoming event. Developers can apply for tickets for the WWDC event and millions worldwide would be able to watch the sessions streamed live. Students as well as members of participating STEM organizations across the world could avail the WWDC Scholarships. Those interested in attending WWDC 2015 may also face disappointment. As in 2012, all the 5,000 WWDC tickets were sold out within two hours of its release which came as a surprise to the developers who had no indication regarding it, from the company. This resulted in disappointment for those who were looking forward to it especially since Apple had decided that 5.30am PDT was an ideal time to release them. Several developers had been there only to find out that the ticket had been sold out. Applying for tickets can be done via the WWDC website. Apple state that it will let the applicants know if they have been randomly nominated by April 20 at 5 pm PDT. To register one’s interest, the need to sign in with the developer account with submission of information is essential. If one is a current member of the iOS Developer Program, iOS Developer Enterprise Program or Mac Developer Program, they are eligible to apply for the same. If selected randomly, the default credit/debit card connected with one’s Apple ID would get automatically charged $1599 on April 20th.